On September 12th 2018, Hanoi National University of Education (HNUE) solemnly held the opening ceremony of the school year 2018 – 2019. The delegates attending the opening ceremony with academic staff and students of Hanoi National University of Education were Ms. Nguyen To Uyen – Vice Secretary of Vietnamese Communist Party Committee of the group of universities and colleges; Mr Nguyen Ngoc Dung – Director of the program of developing the pedagogical universities, on behalf of Ministry of Education and Training; Ms. Nguyen Thi Bich Hop – Vice President of Trade Union of Vietnam Education; Mr. Nguyen Quoc Hung – the representative of Hanoi Police Department; and the representatives of Cau Giay district People’s committee and Police District Headsquare of Cau Giay; the representatives of Dich Vong Hau ward, families of the top students and students admitted without entrance exam; and the reporters from Vietnamnet, Vnexpress and Giao duc thoi dai (Education Times). After the performances from academic staff and students at Music and Fine Arts Education, Assoc. Prof. Dr. Dang Xuan Thu – Secretary of the University’s Vietnamese Communist Party Committee and Vice President of HNUE read the letter sent to Ministry of Education and Training from President Tran Dai Quang on the occasion of the new school year 2018 – 2019. In his speech, Prof. Dr. Nguyen Van Minh – President of HNUE sent high school students, undergraduates and graduates of HNUE meaningful messages. He hoped that they would take positive action to well prepare for their own future, to help people in difficulties, and to develop the next generations. To take positive action, they need to have great awareness, realize wrongdoings, think carefully and make an effort to solve these problems. 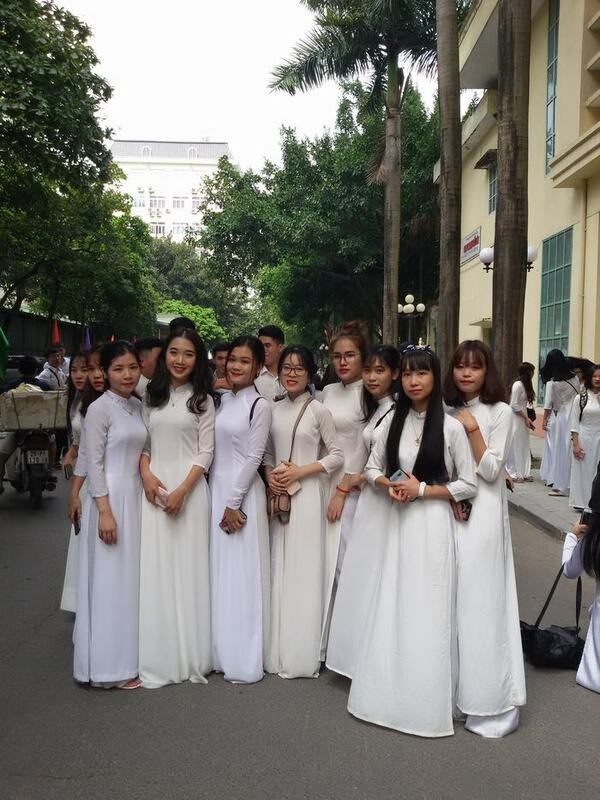 Some typical problems which students from HNUE should cooperatively change are the difficulties of education and the creation of people's belief in education; protecting and preserving the beauty and characteristics of the Vietnamese culture in the development of the country, and the overdependence of people on the digital technology. 1. Completing the development of the standards of graduation of the University and the training sectors, developing training programs, creating the connection between the faculties, supporting the recognition of the programs with partners. 2. Fundamentally changing the manner of administration and service,creating an airy environment in academic activities and operation, putting the works into effective operation; greening the campus; building a truly civilized university. 3. Make the utmost effort to actively implement the tasks meeting the requirement of innovation which are considered as the opportunity and responsibility of all the members of the university. 4. Enhancing the quality of academic staff, continuing to arrange the units of the university suitably, focusing on doing research, publicizing the feedback of the learners to academic and administrative staff; strengthening international exchanges effectively. 5. Encouraging learners to participate in on-campus activities, especially research and training activities. The learners should be considered as the top priority of the university. In the opening ceremony, on behalf of all the staff of HNUE, Dr. Dinh Minh Hang – Lecturer at Faculty of Philology, Head of Political and Student Affairs and Vice Secretary of Youth Union delivered a speech. On behalf of all the students of HNUE, Le Quynh Anh (K68), the top student in the entrance exam at Faculty of Mathematics, had a presentation and sent bunches of flowers to lecturers.